A feast fit for an emperor and his army. Photo by Kristina Gill. Gentedimontagna contributor Katie Parla teamed up with photographer Kristin Gill to publish , a cookbook compilation of the most authentic and innovative Roman recipes. If you happen to be in the Eternal City, here's Parla's guide to shopping the best ingredients. For those who can't get to Rome, mouthwatering porchetta by Vito Bernabei is the next best thing. His family business, , in Marino Laziale just outside Rome, is one of the great porchetta makers of the region. 1. On a clean, dry surface, score pork skin in a diamond pattern (or have your butcher do it for you), then flip pork skin-side down. Massage salt into meat, then dust with pepper, garlic, rosemary, peperoncino, and fennel pollen. 2. 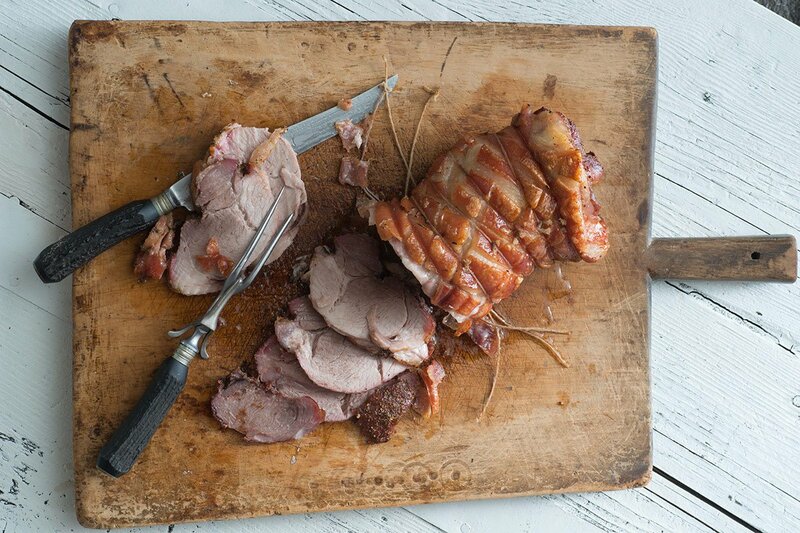 Roll pork tightly with skin facing out, and tie securely with kitchen twine. Marinate in the refrigerator uncovered for at least 6 hours or overnight, allowing the skin to dry out. 3. Remove pork from the refrigerator 1 1/2 to 2 hours before cooking. Preheat oven to 195°F. 4. Bake porchetta until fork-tender, about 5 to 6 hours. Then, increase oven temperature to 500°F and cook for 15 to 20 minutes more to crisp the skin. The skin should be bubbly and blistered, like pork rinds. 5. Remove from oven and allow to rest for at least 45 minutes, then slice and serve. Buy , by Katie Parla and Kristina Gill. These are the best food and drink shops in the Eternal City. Reprinted with permission from Tasting Rome: Fresh Flavors and Forgotten Recipes from an Ancient City. Copyright © 2016 by Katie Parla and Kristina Gill. Photographs copyright © 2016 by Kristina Gill. Published by Clarkson Potter/Publishers, an imprint of Penguin Random House LLC. is a Rome-based food and travel writer. You can follow her on Twitter at and download her . She travels compulsively in spite of the fact that Fiumicino Airport is a national calamity.